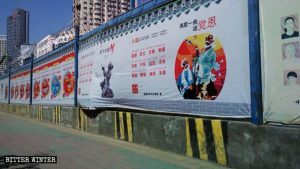 A propaganda slogan poster in Xinjiang’s Urumqi: “Promote the full implementation of the Party Central Committee’s strategy for governing Xinjiang,” guided by Xi Jinping’s thought. 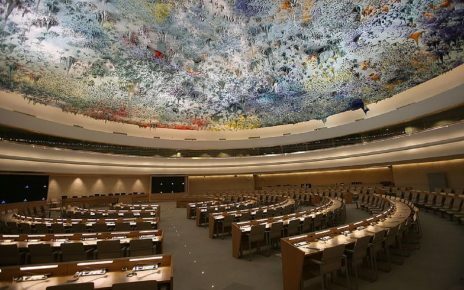 The Chinese Communist Party (CCP) is falsifying its purge of Muslims in Xinjiang by portraying the atrocities as “building and developing Xinjiang,” so many Chinese citizens in other areas of the country do not understand what is really happening to their compatriots in northwest China. One of them is Wang Ming – we use a pseudonym to protect him from being persecuted by the authorities –who recounted to Bitter Winter his impressions after visiting Xinjiang in August 2018. 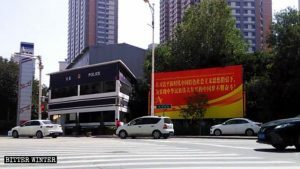 Police station, surveillance cameras, and large propaganda poster in Urumqi. The Xinjiang that Mr. Wang had come to know from reading books was full of exotic appeal, and he knew that local Uyghurs were friendly, hospitable, and multitalented. All of this impressed him and made him look forward to the trip. However, as soon as he arrived in Xinjiang, the sight before his eyes was the opposite of the Xinjiang that he had imagined. “The trip made me feel both depressed and nervous,” he said. Mr. Wang recalled that as soon as he and his companions entered Hotan city in southern Xinjiang, they were all shocked: There were checkpoints set up at all the intersections along the highway, and each was heavily guarded. When passing through checkpoints, each person had to have their IDs checked; the inspections of Uyghurs were particularly strict. The atmosphere in the city was very tense. Only a few pedestrians were on the streets, a fleet of four to five anti-riot and armored vehicles were driving back and forth. Checkpoints were at every intersection, each guarded by at least five officers and soldiers, some heavily armed, and, at larger intersections, heavier weapons were placed. At a checkpoint, every ethnic minority person was forced to undergo a body search, and those carrying a cellphone required to turn it on for inspection. 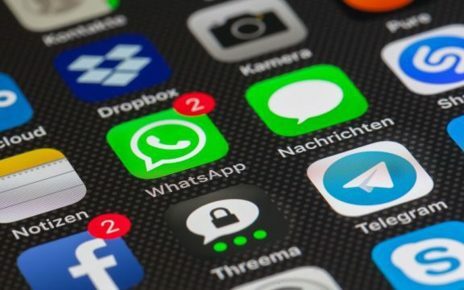 If any information prohibited by the government or slogans considered to be reactionary were stored on the phone, the person would be arrested. In contrast, Han Chinese were allowed to pass through after simply flashing their ID card. All the clerks at street-side stores wore bulletproof vests. Business was particularly dismal at Internet cafés and video arcades. 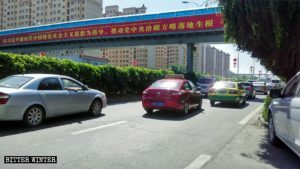 CCP propaganda posters and slogans, such as “Sing the praises to the Party loudly,” are visible everywhere on the streets. According to the owner of a local Internet café, in order to prevent people from circulating negative information about Xinjiang online, the government strictly regulates Internet cafés, and has ordered each Uyghur who goes online to register with their real name. As soon as evening falls, practically all local Uyghur youths do not dare to go out, because as soon as they encounter the police, they will be questioned and investigated. As a result, there are only some soldiers who occasionally come to the Internet café to have fun for a while, making it hard for the owner to make enough money just to feed himself. After Hotan, Mr. Wang and his travel companions went to a nearby village. “Every village is surrounded by barbed wire. You have to go through a checkpoint to enter the village,” Mr. Wang recounts. The ethnic Han village chief received the travelers with great hospitality. He said that the government sent him to supervise Uyghurs – the majority of the village’s population. His daily work consists of organizing the adults to attend two Chinese language classes each week to learn pinyin and Chinese laws. If somebody misses a class, the chief sends an official to their home to ask the reason for their absence. 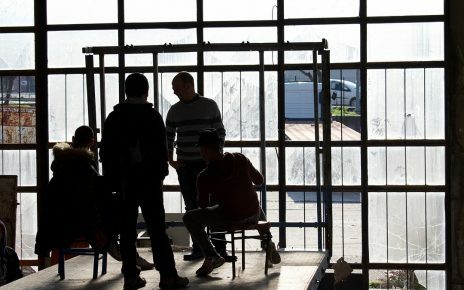 If a person skips three classes, he or she faces the risk of being locked up in a transformation through education camp. The chief is also in charge of registering the status of members of each household entering or leaving the village, to keep a tab on Uyghur villagers’ movements. He is very happy with his work and revealed that in every village in southern Xinjiang, the village chief is an ethnic Han assigned by the government. The government also equips each village chief with an off-road vehicle and provides a relatively good salary and benefits. When leaving the village, Mr. Wang discovered that there was only entry and exit point: all other roads have been blocked off. Such planning makes it easier for the government to control the village. “The people here are like birds trapped in a cage,” Mr. Wang said with a sense of hopelessness. While passing through the Gobi Desert region, Mr. Wang saw a large prison being built. All of the construction workers were Han Chinese. One contractor revealed that the reason for so many prisons was to prevent Uyghurs from rioting: as soon as a riot occurs, everyone involved is locked up in prisons. Villagers in southern Xinjiang live in fear every day now, afraid of being implicated and arrested. On the way back, the travelers passed through Urumqi. What gave Mr. Wang a lasting impression was the ubiquity of CCP propaganda posters, the main content of which was: Follow Xi Jinping towards the “Chinese Dream;” only following the Communist Party will ensure a happy life. 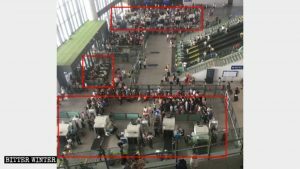 Meanwhile, at Urumqi Railway Station, Mr. Wang and his companions were subjected to a strict security check. Aside from having their IDs checked and full body scan, they also had to undergo facial recognition procedures. One armed police officer checked every item that Mr. Wang was carrying with him, even his cigarettes and paper towels were taken out and examined. “The inspections at this checkpoint are the most thorough and the slowest, so the waiting line is extremely long,” Mr. Wang said. 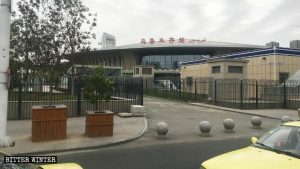 Security check zone at Urumqi Railway Station.